..:recycled minds:..: Chomsky on the U.S.
"George Bush would be in severe political trouble if there were an opposition political party in the country. The striking fact about contemporary American politics is that the Democrats are making almost no gain from this. An opposition party would be making hay, but the Democrats are so close in policy to the Republicans that they can't do anything about it." Chomsky also talks about the war in Iraq (of course) and the U.S. foreign policy in general. He states that there really is no War on Terror, and that the U.S. is really out to control natural resources, namely oil. If you have not read Chomsky before, this is a fine example of his style of critique. If you have, check out this interview as one of his most recent. 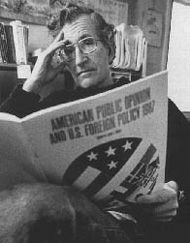 And finally, a happy belated birthday to Dr Chomsky, who recently turned 77. There is no real opposition in the US. But then what are we to do? Vote for Ralph (the joke) Nader? That is just a vote for the Republican party. We are headed toward a very dark time in this country. The hate-filled right wing is about to take over the Supreme Court. I hope all of you that have a real belief in civil rights and freedom from religion are ready. We all may need to make REAL sacrifices for the future of the country. I'm not sure if the U.S. can change or not. It seems like it might be too late to wrest control and power away from the corporate elite and their military backers. It may be time to seek out a new home somewhere that might welcome alternative thinking people from perhaps the most hated country on the planet.